S3 Parents and guardians are invited to attend the S3 Parents’ Evening in Harlaw Academy on Thursday 7th February 2019 to meet their child’s subject teachers. Our Guidance Teachers will be available to discuss pupils overall progress at school and also present on the evening will be Mrs Rennie the Year Head for S3 and Mr Mitchell our Principal Teacher of Support for Learning. Please note that there is no parking in the school grounds and you are asked to use on street parking available in the surrounding area. Harlaw Academy uses an online booking system for parents through our Groupcall Messenger system. This allows you to book appointments at times that suits your availability. 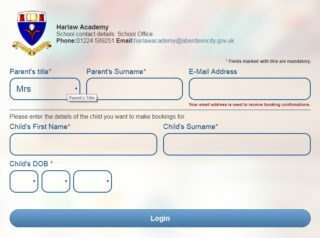 The Parent’s title and Parent’s surname must match the information we hold in our system for your child’s main contact and we will send a Groupcall message to let you know the Parent’s title and Parent’s Surname to use when logging in. Full details of how to book appointments is available on the website homepage and booking is open from Wednesday 30th January at 12am until Tuesday 5th February at 10am. On the evening we ask that your child attends with you to take part in the conversations with their teachers. We also ask that you bring your list of appointments with you. We look forward to meeting you on Thursday 7th February. Copyright © 2019 Harlaw Academy.